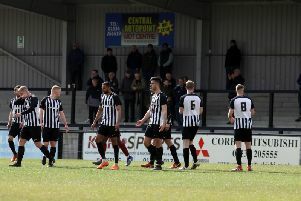 Steve Kinniburgh believes Corby Town will want to keep the vast majority of the squad that finished the Evo-Stik Northern Premier League Premier Division season, despite their relegation on the final day. The Steelmen will begin picking up the pieces this week after their attempt at pulling off the great escape failed at the final hurdle after they were beaten 4-1 at Coalville Town on Saturday while Sutton Coldfield Town edged ahead of them with a 0-0 draw at Workington. Corby had looked dead and buried when they were 12 points adrift of safety on Boxing Day but a remarkable revival was started under the leadership of Gary Mills, who was later sacked before Kinniburgh took charge and so nearly finished the job. But the reality of relegation now sinking in, Corby will have to start thinking about life at a lower level. The first task will be to appoint a new manager and Kinniburgh is yet to throw his hat completely into the ring, although he will still be at the club in his role as the academy director. But, when it comes to the squad that finished the campaign, the Scot would like to see the majority of them stay on to help the club bounce back. “We will reflect on the last few months of the season,” Kinniburgh said. “This isn’t a group that anyone will want to get rid of. For me, going forward I will be at the football club because I am the academy director and it will be up to the board of directors to decide if I have a role to play in the first-team and at what level. “I wouldn’t imagine many of these boys will be shifted on. It will be up to them. If they want to stay here I would imagine the majority of them will be wanted back at the club because these aren’t the boys that got us relegated, these are the ones who almost got us survival. “We will get on to the drawing board right away and see what these boys are wanting to do. “We will see which ones have something about them and say they want to stick with it and see if they can help us bounce back. “It’s not going to be a mass change. We have finished with some young local boys on the pitch and they have the chance to go and kick on with this club now.